When you or someone that you love has been injured in an auto accident, it must be taken very seriously. These kinds of collisions can result in major changes to your overall well being and quality of life. This is especially true of motorcycle accidents. Many people who have been injured in motorcycle accidents are never the same, which is why teaming with skilled personal injury attorneys is so crucial to ensuring that you receive the damages that you need to recover. As our auto accident attorneys point out, motorcyclists are more exposed to potential injury and harm than other people on the road. (Save for pedestrians and bicyclists.) A motorcyclist is much smaller than other vehicles, and even a good helmet and riding jacket are only so much protection against serious collisions. What does "fault" refer to? When referring to "fault" or an "at-fault party," we are simply talking about the person who is responsible for the accident occurring and the injuries taking place. The responsible party is shown to have demonstrated negligence. This is sometimes harder to prove than you think, but it's a critical part of determining damages and seeking justice. One example of negligence in motorcycle accidents is when a driver fails to check his or her blindspot when merging or changing lanes. This leads to many accidental collisions with motorcyclists on the road. Another example of an at-fault party is a person who is driving while under the influence of drugs or alcohol. With decision-making skills and reflexes impaired in that manner, they need to be held accountable for any damage or injury that is caused. 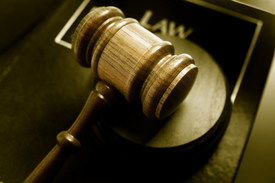 Whatever the case, be sure to speak with a personal injury lawyer as soon as you are able. This will set the wheels in motion and allow you to collect the damages that you are entitled to. Before moving forward with a personal injury or wrongful death lawsuit, it's important that your attorneys determine who's at fault. This will involve looking at medical records, police records, and any evidence gathered to help recreate the events of the accident. By finding out exactly what happened, we can hold those responsible accountable. When we determine who the negligent party was in an auto accident, we may find out that a third party or an additional party was also at fault. In those cases, we will adjust our legal strategy to seek justice. For example, if you experienced a motorcycle collision with a motorist who collided with the motorcycle because of poor brakes or a mechanical failure of some kind, that motorist may not be to blame. Instead, the vehicle manufacturer or parts manufacturer may be partly or wholly to blame for the severity of the accident and injury and should this be held accountable. If you or someone that you love has been injured in a serious auto accident, be sure to contact our White Plains, New York personal injury lawyers today. By speaking with our legal experts, you will be able t receive the help you need to receive just compensation for injuries and other losses.